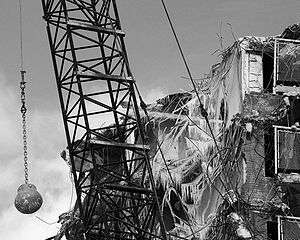 English: Wrecking ball in use during demolition of the Rockwell Gardens housing project in Chicago, Illinois, February 2006. I’ve written before about where my ministry shoulders are “broad”, meaning the areas that I feel competent and trained and able to execute fairly easily. When I began to teach and preach regularly a few years back, that started developing into an area of confidence and competence as well. I never thought of myself as a preacher, but I knew that words mattered to me, and somehow (for better or for worse) I was able to string together series of them into phrases and thoughts that seemed to matter to people. It seemed like I could do some good; people came up and affirmed me, and told me how much these thoughts and phrases had challenged them, or helped them to see God in a new way, or comforted them. A part of me loved every minute of it. My ego soaked it up, and began to believe all of those words that I heard. Each time I walked up onto our little platform, I desired to be poignant and clever; I wanted to shake people up, to invite them to see God and His world in an awe-filled and worshipful way. I continued to do some kind of good, and accepted people’s compliments with the requisite, “aw shucks” attitude that pastors are supposed to have. But in retrospect I think that I was rotting inside. When I began my sabbatical back in January, Jesus started dealing with me in some very serious, foundational ways, and one of the truths that I’ve had to deal with is how full of myself I can be. My pride can be horrific. For the past 10 months or so, I’ve been journeying inside myself to find all these nooks and crannies where destruction lives, and attempting to bring them out into the light where God can deal with them in a loving but firm way. As a result, I’ve begun to feel somewhat like a normal human being. But what’s been interesting—and even a little scary—is how it has impacted my ministry. Because I have less confidence than ever. Because I stumble over words more (maybe our congregation doesn’t notice, but believe me, I do.). Because I feel mostly like I don’t have any idea what I’m doing. All because Jesus showed up. All because he showed up to show me how ill I truly was, how my ego was destroying me, how my inflated and false sense of self was keeping me from knowing healing and some semblance of love. He showed up—not because he wanted to tear me down as a pastor—but because he wanted to build me up as a human being. He comes to do that, you know: to turn us into full human beings, like we’ve always been intended to be. He’s still working on me; I’m still speaking and playing music, and I’m growing used to the idea of not being in control of everything. He’s better at it than I am. This entry was posted in faith, personal and tagged healing, Jesus, ministry, recovery. Bookmark the permalink.